I love Dropbox and use it daily. From sharing project files and source code repositories in professional life to saving and synching my important personal belongings, I wouldn’t want to miss it. For the services I like and use, I usually don’t bother paying for them. But in the case of Dropbox, just no plan seems right. I’m not even talking money here, but storage – the entry plan being 50GB. On my main machine(MBA 11″), I’m running a 128GB SSD – meaning that after having installed all necessary tools, I don’t even have 50GB storage free for things that I want backed up or synched. Since I can’t even physically use the plan properly, I don’t see myself paying for it. I would have been glad to pay for a 10GB or 20GB plan, though. Not even having 50GB storage might seem very little space to the reader – or for my former self, that is. But for the stuff that I previously needed a NAS or even dedicated servers, I now have the cloud. Mail is on my private server (and backed up), music is on Spotify and Soundcloud, movies are in iTunes. The only thing I’m still hosting and managing myself are pictures. Still, I wanted more than the 2GB storage that Dropbox offers for free initially. Luckily Dropbox offers up to 16GB extra space for bringing in referrals. 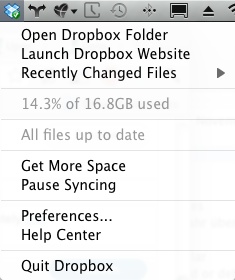 Over the last year, I’ve gotten a few people to use Dropbox and got my account up to over 4GB. 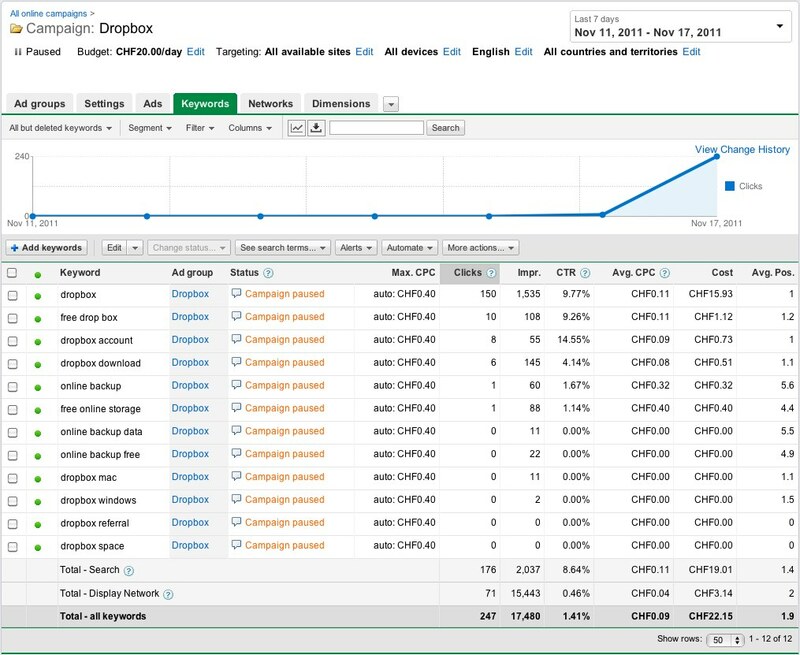 But then I thought that I could improve this process and set up an AdWords campaign. Just one day later and having only spent 25USD, my Dropbox account is now 16.8GB. Here are the details of the campaign. You can see that it only took a day to accumulate enough referrals. So now I can start putting more files into the bigger Dropbox. Update: As mentioned in the comments, Dropbox normally grants 250MB per referral. If you own an edu email address, however, they will give you 500MB – even retroactively. If you happen to live outside the USA and your university uses a different TLD, don’t worry – there’s a form to put your address, they will verify it and let you join the edu program. on so many things at once, I’m having trouble to keep track of what matters most. Well, at least it kept me from writing any dedicated posts – long enough to feel a lack of new information. One important change is that I won’t be a tutor in my favourite living place Pfaffenhof anymore. The last couple of days I arranged everything that is needed for a final transition – bank account, phone, duties and loads fun will be transferred to several of the old newcomers geezers in 48G aka “the cage”. Doing so really was a latecomer considering that I have left my former accommodation in August 2008.. At first I thought and hoped that it would prove possible for me to go back there on a regular basis to be able to put things into perspective for my successors (of course also because I miss the place), but time has proven me wrong – another approach had to be established. The last years have been a great ride. I met lots of people, gained intimate friends and learned just so much – mostly about myself and how to cope with daily life, but also with people which has proven time and time again as somewhat useful^^ This period has formed me and will never completely be abandoned from my consciousness; the memory will always be present. Then I started consolidating my own debts and the credit vouchers I gave out. Ultimately this will earn me some nice profit bring back some long lost money if everything works out and everyone is going to pay. What I have learned here is that most people tend to have a different personality when it comes to money – lucky for me my resources have recently grown quite a bit, so I don’t have to adjust to this new information. On the blog side I have written a few lines of PHP code to include the server uptime(currently 187d – which is only limited due to the recent power failure) and I generated a musical tag cloud from my last.fm profile. Long due was a favicon – now I deployed one for web and feeds. Looking at my server, something had to happen soon – since my SPARC/Solaris10 setup is growing constantly, mostly in hosting an increasing amount of web applications(3x Drupal, 2x WordPress, 2x Rails) but also doing a job as file server and probably soon again as mail server, I felt a decent need to find myself a working backup solution. Lucky me that I recently bought a 1TB harddrive for my Mac; meaning that at least one of my machines finally has an autonomous, automatic and failsafe backup mechanism – Timemachine. All that was left for a server-side backup was to write a little Bash-script that aggregates all data and configuration, zips these up, sets a timestamp and deploys the resulting file to the web – while my Mac waits for a new arrival and simply downloads it to the local disk which is automatically being backed up again. In a matter of an hour I achieved a customized double backup for my server; without any costs, with full transparency and available hardware. Others might prefer commercial solutions like Amazon S3 – I like to be in charge over my own data myself, preferably. Besides; if I wanted a more professional setup – I would turn to ZFS and storage directly connected to the server(probably via iSCSI). But since I’m not residing just 10m above my server anymore and my solution really fulfills all my needs, I won’t have any bad dreams on this topic. On what was most important in my last week I will only comment briefly, but I have paid a visit to Weimar again. We had a lot of fun and we have spent great quality time together – at least that’s how I remember it; you never know(; I’m very much looking forward to our next happening.